This month has certainly been a focus on brows and I can't complain about that! 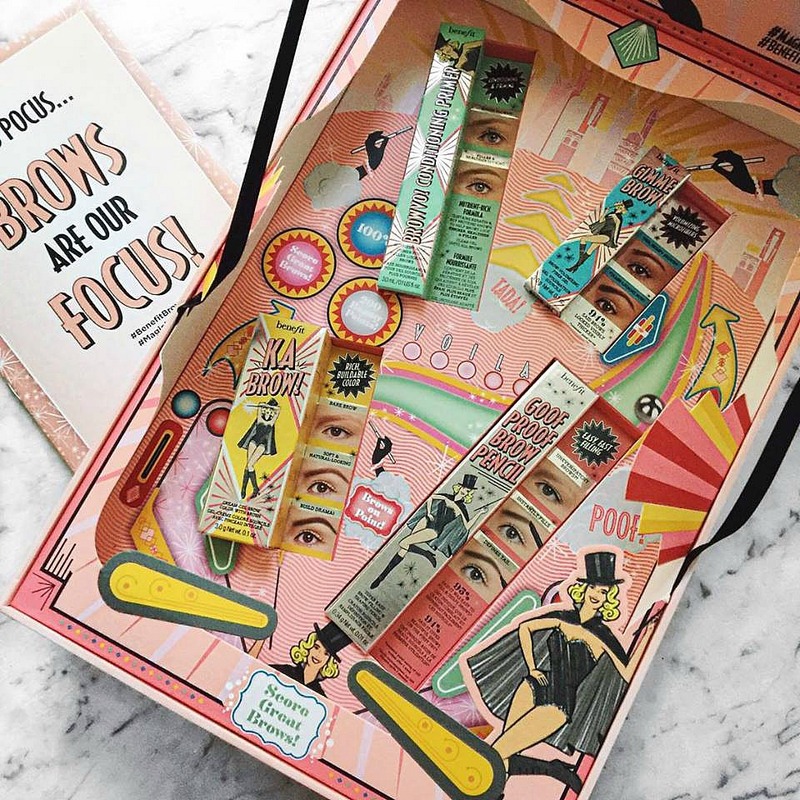 I have recently been sent an amazing package from Benefit Cosmetics and I was so excited (so excited that I actually squealed!) when I opened it and saw what it was. They even had my name embossed on the packaging, it was so pretty and I'm never throwing it out. Ever! Benefit is known for their amazing PR parcels, and I was so grateful to have received them as I love their products and their motto "Laughter is the best cosmetic... so grin and wear it! 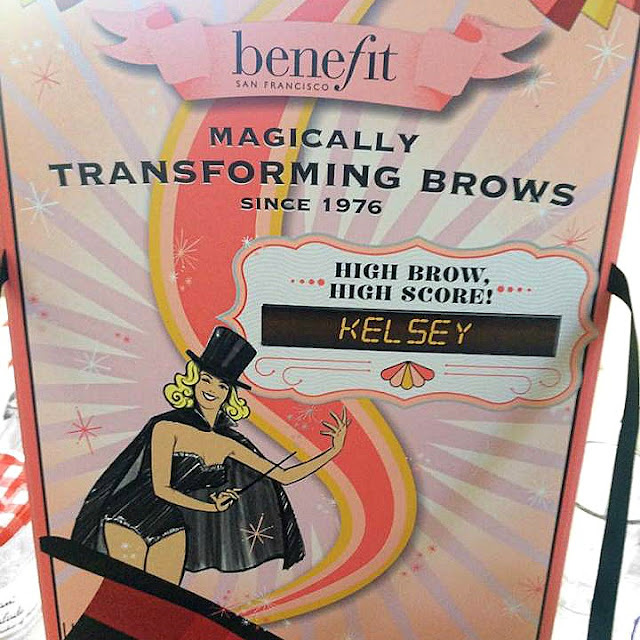 ", so thank you to the beautiful team at Benefit. Alright... on to the actual products themselves! I was given four products to try out from their new brow collection (their biggest launch collection yet!) which will be available to buy for the Australian public on the 22nd of July! I will talk about them individually below. I'm sure you have heard me mention Gimme Brow over and over again the past few years. I mentioned it in my April Favourites and I raved about it on Instagram, to my friends and family, even to my clients. It is such an amazing product that I actually truly love. Gimme Brow is now available in three colours: light, medium and deep. It tints your brows and has little fibres to help give you a fuller-looking brow. On my lazy makeup days, I use this by itself, and on my normal makeup routine, I use this to help set my brows in. If you haven't tried this, please do yourself a favour, and go out and buy one for yourself! You won't regret it. I'm a big lover of brow pomades, I like how you can be really sharp and precise on the angle of your eyebrows with a pomade. So when I realised Benefit has actually made their very own, I was pretty thrilled to try it. The packaging for Ka-Brow! is very clever. It has it's own built-in angled brush that you just pop out from the cap. I was very surprised at how well the brush worked, so, naturally, I was wrapped. On the packaging, they have mentioned that you can achieve soft and natural brows or build more drama (darker brows), which is very true. The pomade itself, I found so easy to work with on the brows, I had no trouble at all - it wasn't slippery and it glides on very nicely! They have 6 shades that you can choose from, so there's a colour for everyone! This product would be great for someone who has sparse brows. This isn't a problem for me, so I don't really need to use this as I have quite full brows already (Thanks Dad!). However, I will tell you more information about BROWVO! It works two ways, firstly it conditions your brows, you can wear it overnight and it will help condition and grow your brows over time. Another way you can use it, is to prime. You can wear it underneath any brow products and it will help extend wear and enhance the colour. The applicator is very soft and squishy, which is good for applying evenly! This brow pencil has a very interesting shape! It is triangular (including the actual pencil/stick) and I like that you don't have to sharpen it, as it is already sharpened for you (bonus!). You can achieve a very fast and natural look which is great for those hurried mornings! The tip is pointed which helps to define your brows and the wide tip fills the brows in easily! I love, love that it has a spoolie brush on the end! I use spoolies all the time - it helps diffuse any harsh lines that you may have inadvertently made on your brows. I really like this product! The other brow products that are included in the new collection are also: Ready, Set BROWS!, Brow Zings, High Brow/High Brow Glow, Precisely My Brow Pencil and 3D BROWtones. Want to know which are my most used and favourites? Definitely the Gimme Brow and Ka BROWS! I use them every day now and you can't go past the Goof Proof Brow Pencil, for those mornings I need to get on the go quickly. I simply can't fault them and don't have a single negative thing to say about them! I hope you liked my honest thoughts on these amazing new products - let me know which ones you pick up, I would love to know!